I’m rhapsodizing about graphic novels again but if you’ve read the works I’ve reviewed previously for Vegbooks, you’ve (I hope) fallen in love with Owly and Hilda as our family has. You will also love Rayburn, the titular Monster on the Hill by Rob Harrell. Now, the back cover blurb of this book includes endorsements by Neil Gaiman (my favorite young adult book by Mr. Gaiman is The Graveyard Book) and Jeff Smith (his Bone series is a great adventure comic) so I feel a little redundant singing the praises of the review copy of this book that I received from Top Shelf (publisher of the Owly series and other great kid friendly titles). This 186 page self-contained, all-color graphic novel can be read aloud (or to oneself) in an evening, which is exactly what happened in our house. My daughter loved the look of the grumpy Rayburn on the cover of the book and asked her father to read it to her. 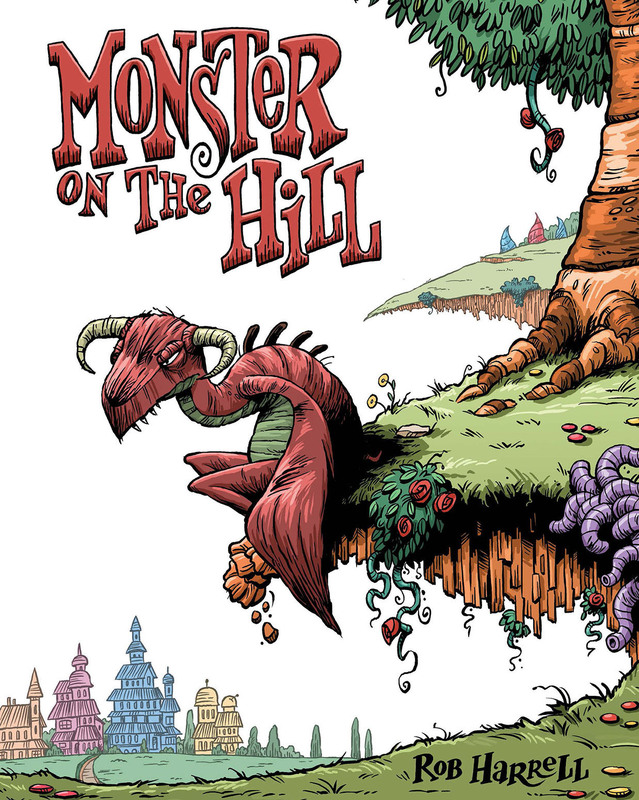 My husband does not usually read comic books as the format isn’t a favorite with him but father and daughter read on the couch with increasing interest as a fallen from grace scientist and a town crier attempt to improve the stature of their local monster. You see, each village in the story has a monster that terrorizes their town and by turns protects them from the likes of the fear-consuming Murk. We learn this when Rayburn leaves his town unguarded while trying to improve his outlook on life. Rayburn just doesn’t measure up to the standards of other town’s monsters until he manages to (spoiler alert) save the day in the end. I asked my daughter if this book was good for vegetarian kids and she said it was because the monsters just want to eat people, not animals. When I tweeted about this observation, Vegbooks founder Jessica pointed out that her daughter’s response was that people are also meat. I think the fact that the people in the book all like being scared by their town monsters tips the scale in favor of this book being veg-friendly. Mentions of food involve a scene where the town crier becomes a mushroom when he eats a mushroom not intended for kids under 11 and a part where Rayburn remarks that caramel corn and hot pockets are his foods of choice. There is an epic fantasy battle of sorts that I found appropriate for kids as young as 4 and 5 but parents should be aware that the Murk is killed in the end of the book. The artwork is expressive and lively and the fonts are easy to read for young and old alike. I especially loved the expressions on Rayburn’s face throughout the book as well as the earthy colors throughout. The themes of the book, to me, involved rediscovery and rebirth as well as bravery and friendship. We love graphic novels aimed at the younger set over here. We have read GIANTS BEWARE! several times already. Thanks for the heads up for Montster on the Hill – we’ll be picking it up. Just discovered your blog through Yeah write and I’m so lovin’t that you’re linked up. Will be by regularly. Kristin, thank you for the recommendation! I remember reading good reviews of that one when it came out and never got around to seeing if our library had it. Adding it to our list (once I return a few books, we hit our maximum 50 checkouts last week, oops)! LaTonya, thank you for the comment and for stopping by!